Data Feeds are available during Trading Business Hours from Sunday to Thursday, from 10:00AM - 2:00PM. Also, note that Data Feeds are not available during public holidays observed by the financial market. Welcome to CBD Financial Services, a subsidiary of Commercial Bank of Dubai, which was established in 2005. CBD FS is the leading financial services that offer our clients all brokerage services they need to build a balanced and diversified portfolio in the both Dubai Financial Market and Abu Dhabi securities market. We provide you the right tools to plan for some of life's biggest financial Indicators in fast, reliable and safe access through an easy online execution platform and mobile app at very competitive commission rates. Are you aware of the advantages you get by joining CBD FS? Enables you to set up personalized views with just the tools you need. Fully customize your view to fit your own individual trading strategy. Provide you with competitive commissions. Maintaining Trading Accounts for UAE Markets (DFM & ADX). With CBD FS, you can invest in both the Dubai Financial Markets and Abu Dhabi Securities Market. you to get the most out of your investments. First class services. First class rates and First class support. 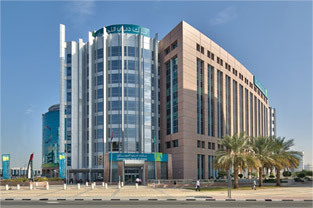 Established as a public institution with an independent legal entity by virtue of Decree 14/2000 issued by the Government of Dubai, the DFM lanched its activities on 26th March 2000.
within a short period of time, the Dubai Finanical Market(DFM) has fast developed into a leading financial market across the region. its ongoing efforts and strategic initiatives have further reinforced Dubai as a centre of excellence in this part of the world and enhanced its leading postion as a powerful capital market hub which embraces international best practices to meet the evolving needs of its investors locally and internationally. DFM operates as a secondary market for the trading of securities issued by public shareholding companies, bonds issued by federal or local governments, local public institutions and mutual funds as wel as other local or foreign DFM approved financial instruments. Abu Dhabi securities Exchange (ADX) was established on 15th of November 2000 pursuant to the local law of the Emirate of Abu Dhabi No.3 of 2000. The Exchange is considered a local public institution that is subject to the local laws of the Emirate of Abu Dhabi in addition to the supervision and control by the Securities and Commodities Authority. Since its establishment, the Exchange has gone through various major developments in the legislative, regulatory and organizational fields. In the legislative field, the Exchange introduced several modern legislations using the best international practices and legal and technical expertise not least are those legislations related to trading, monitoring and governance, in addtion to keeping up with the legislations of the Securities and Commodities Authority using mechanisms that organize the application of these legislations such as those related to the market maker, the custody services, delivery versus sale...etc. In the monitoring field, the Exchange has adopted modern electronic systems for monitoring, settlements and clearance, it also updated these systems to match those used in international exchanges such as Extreme and Smarts. Regarding the organizational aspect of the work, Adu Dhabi Exchange sought assistance from the experts to carry out the organizational and technical tasks, and was able to raise a generation of national staff that was able to effectively assume the responsibility of all technical and organizational issues and provide attention to the training, qualification and awareness on a continuous basis within an advanced administrative environment. Furthermore, the Exchange carries out international activities on the level of Union of Arab Capital Markets, the World Federation of Exchanges (WFE) and the Federation of Euro-Asian Stock Exchanges (FEAS) among others. Abu Dhabi Securities Exchange has been classified under the Emerging Markets Index by Morgan Stanley MSCI in 2014. Do you have access to International markets? At present, we offer access only to the UAE markets (Dubai Financial Market and Abu Dhabi Securities Exchange). If you have lost or forgotten your Password, please call on +971 4 212 1010 and one of our consultants will advise you. How do I login to Attijari Online? Enter the token number and then you are ready to access Attijari Tadawul. How will I receive the online trading or Mobile App password? How can I apply for Attijari Tadawul or Mobile App? What is required to get started with Attijari Tadawul? Is trading through the Internet safe? The safety of transactions on the Internet and mobile app depends on the encryption system used. The better this transaction system, the more difficult it is for any person to hack the site. Internationally, the best system available today, is the 128-bit encryption, a system, is one of the few online share-trading sites in the country equipped with this 128-bit encryption. Secondly, you too can ensure the safety of the transactions online. You normally get a secured user id and password, the secrecy of which is to be maintained entirely by you. Thirdly, if the transaction system requires no manual intervention, you further improve the safety in the transactions. This enables the elimination of the possibility of any manual intervention. Which means orders are directly sent to the market ensuring that you get the best and right price. Mobile App is an application from CBD financial service that enables you to trade and manage your UAE stock markets portfolio in real time from your phone any time. View DFM and ADX market watch. By phone: Orders can be placed by calling the brokers thru the phone on +971 4 212 1017 or +971 4 2121 1022. Mobile App: Orders can be placed from your phone. Walk-in in the branch: Orders can be placed after signing buy and sell slip. Do I need a Bank account with Commercial Bank of Dubai? Yes, you need to have either current or saving bank account with CBD that would be used for transferring funds to the trading account or withdrawal. What is a trading number? Trading number is a unique number given to you by the brokerage company to identify your account with them in DFM & ADX market. What is an investor number? The National Investor Number (NIN) is a unique number given to you as an investor. It identifies your account at the Clearing and Depository Settlement (CDS) with the market, which holds all investor shares. A separate Investor no is needed for each Dubai Financial Market (DFM) and the Abu Dhabi Exchange (ADX).